Ever since Lorde broke into our consciousness with ‘Royals’ four years ago a lot has been written about her ability to craft perfect pop music. So to say that her second album has been hugely anticipated would be underselling it a little. That anticipation peaked with the announcement of Melodrama in March being accompanied by the brilliant lead single ‘Green Light’, an absolutely joyous and uplifting break up song. If you’re going to announce your return, it might as well be with a worldwide smash. Whilst the anticipation was huge, I confess there wasn’t any particular anticipation on my part. While I own a copy of Pure Heroine, I rarely listen to the album. That’s primarily because “pop” music is not my go to genre. Generally when I look for music to suit whatever mood I happen to be in, Lorde isn’t high on the list. I appreciate the merits of Pure Heroine and Lorde deserves every plaudit she received. I’m just explaining my standpoint prior to the release of ‘Green Light’. 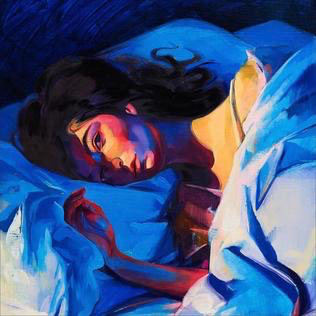 Before I decided to review Melodrama I fully expected ‘Green Light’ not only to be the peak of the album but the precursor to the tone of the record – that isn’t entirely correct. While the opening single is pure uplifting house piano and perfect pop chorus, there is real depth and atmosphere, coupled with intense vocals. What we have is much more substance than style and that is the tone of the record. There is a complexity to every song and an emotional strain throughout such as loneliness, bitterness, hedonism and a loss of control. It’s been described by the singer as “dealing with the themes of heartbreak and solitude” and those are written all the way through. Musically, the depth comes from ever-changing beats, strong synth and piano sounds, quite beautiful guitar work in places and layers of melody and harmony, threaded with perfectly pitched and breathless vocals. Lorde manages to convey so much emotion across 40 minutes that it’s difficult to define high points. Melodrama is bookended by the album’s two singles so far. It seems intentional to contrast the kind of rebellious, almost manic, driving opener with the introspective thoughtful, looking to the future perspective of ‘Perfect Places’. Two excellent songs, which both offer perfectly uplifting moments and are ideal singles. For me, they also serve another purpose, which may or may not be intentional. Everything in between is darker, with a more disparate tinge and the songs flow into each other with real intensity. The hedonistic thoughts and recklessness of ‘Homemade Dynamite’ runs straight into ‘The Louvre’ where the guitar accompanying the vocals lay out yet more recklessness and builds into a dark 80’s style anthem. Lyrically it’s both smart and witty and flows into ‘Liability’ with the melancholy ramped up, and piano accompanying the introspective vocals it makes for a beautifully sad song. The centre point to the record is ‘Hard Feelings/Loneliness’. A two-part tale of break up, where ‘Hard Feelings’ deals with the actual breakup and the pain that those moments bring before morphing into ‘Loneliness’. Preempted by a male voice and the mention of a “favourite tape” which in terms of imagery is as archetypal as you can get, the track starts with the hip-hop staple sample ‘The Big Beat’ stylings and plays out some very disturbingly Fatal Attraction-style sentiment. It could be pure pop perfection, if it wasn’t so terrifying. ‘Sober II (Melodrama)’ feels like a reprisal but provides a link into ‘Writer In The Dark’ which is an almost apologetic but defiant piano-led number that has a wondrous Kate Bush chorus. Another brilliant song which marks the end of the darkness and sadness, leading perfectly to ‘Supercut’ which will surely be a single also. This is a sweeping, epic track that reminisces a little lyrically but is primarily an uplifting moment, again driven by that classic house piano. There is also then a reprisal of ‘Liability’, giving off more of a “it’s 2am and the party is over” vibe than the melancholy of earlier. I may not fall into Lorde’s target demographic but, in this nearly 40-year-old father of two, she’s gained another fan. A strong intelligent woman, making strong intelligent music. That sounds melodramatic but I think that’s the point!